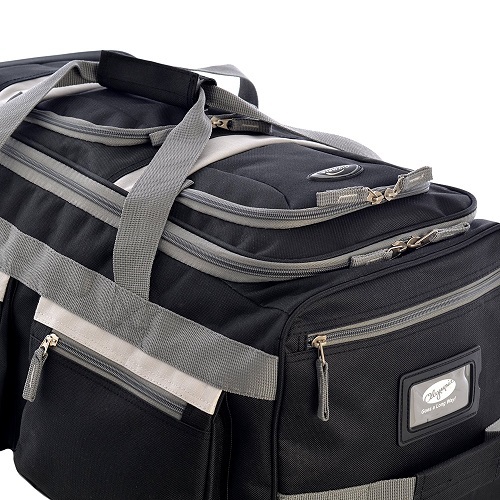 This review is covering the Olympia 22” rolling duffel bag by Olympia. It is a perennial best seller and the price certainly plays a factor in that. We’ll do a short review of the style, durability and its overall functionality which surprising did not do as well as I would have thought. If you want to skip all of the reading and just get down to the nitty gritty, then scroll to the bottom to see what’s good and bad about the Olympia duffel bag. 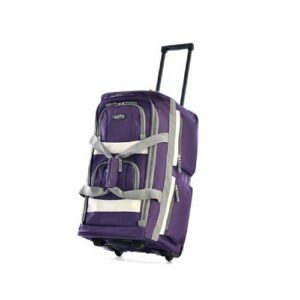 The Olympia Luggage 22 inch duffel bag is a bag with a purpose and you can clearly see that from the design of the rolling duffel bag. 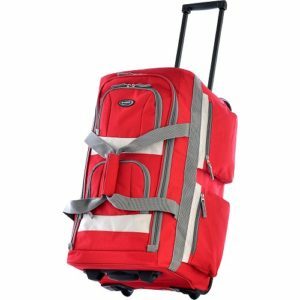 Olympia clearly made their luggage rolling duffel bag with traveling on the mind; it’s built for people on the go. Olympia’s 22 inch rolling duffel bag comes in many colorful variations, eighteen to be exact. They have a little bit of something for everyone to express who they are. 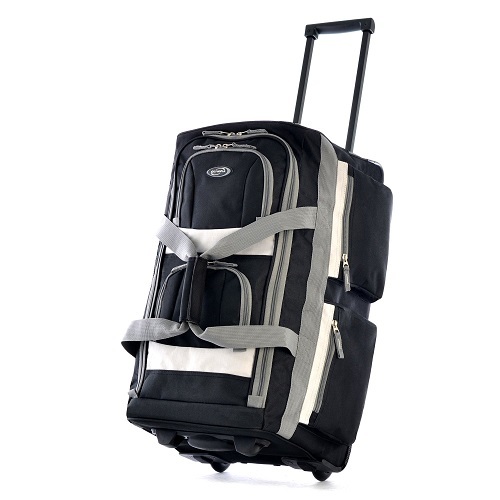 The way they were able to design this rolling duffel bag also gives it a multi-purpose use. You can use this when traveling, including flying, or to take it to the gym, or use it as a school duffel bag perhaps. It’ll work great any way. Although there’s not a whole lot that can be said for style in regards to this type of travel gear, the Olympia 22 inch is still a duffel bag. Not the stylish piece of gear you can own and more of a quick getaway or short trip type of luggage. It’s 22 inches high and 12 inches wide, so you can see it’s a fairly small piece of gear. All in all the Olympia 22 inch rolling duffel bag does a fine job with its overall design and I’m glad they gave their customers a number of options to choose from when it comes to colors. There’s not much else you can do to improve on the look and for that I will give the Olympia 22 inch duffel bag 5 out of 5 stars. The durability of the Olympia 22 inch rolling duffel bag has done a great job so far and I’m quite pleased with how well it’s held up. I’ve traveled with this for a couple of weeks on a handful of flights and so far there has not been any tearing or threads coming undone. The Olympia duffel bag is made with what they call “Protecflon” which is just their fancy made up term meaning that it’s just made of 1200 denier polyester. This is fairly thick and resilient polyester and is constructed very well. There was a small issue when I received the Olympia duffel bag, it stunk! It smells horrible when you first receive it, like that plastic chemical smell. You can let the bag sit outside in the sun for a day or two with some baking soda scattered on the inside and that will remove the smell. However, if you’re too lazy or just don’t want to deal with that since you paid for it (which I completely get) then you may want to consider looking at something of better quality like this Samsonite duffel bag. The Olympia 22 inch duffel bag has done a fine job holding up and I’m pleased with how well it’s made. The only issue I have with it is the actual smell of the bag. It’s almost worth returning and certainly is if you have no plans of removing the smell as it will make all of your clothes smell otherwise. For these reasons I give the Olympia duffel bag 4 out of 5 stars. The Olympia 22 inch duffel bag had me going back and forth with its functionality. At times it appeared to be doing great but then I would notice something that just didn’t work like it should and it started making me rethink the whole product. I’ll start by stating the obvious, this duffel bag has plenty of pockets and room to organize everything you would need to pack in a duffel bag. You have two pockets on each side, two on the front of the duffel and a single pocket on the top by where the handle comes out of. Then obviously you have the main compartment which is counted as a pocket. The main compartment is accessible by a U-shape opening that allows you to reach anything you have in the duffel without having to go through other items you may have brought along. It’s very convenient and well thought out. The inline skates, however, were not as well thought out. The wheels on the Olympia duffel bag are a smooth style so that it doesn’t make noise when rolling along, which is always nice. But that’s about the extent of what they have going for them. The wheels while they do roll well are a little close together so if you happen to go over a bump or something, the bag will have a tendency to start flipping over. We’ve all been there and it’s maddening! I love the fact that the Olympia duffel bag has a handle and it does a fine job of pulling your travel gear along but I noticed in my journey with it, that it does have a hard time locking into place and will sometimes slide back down. A minor issue but it can still be frustrating. I notice while using this bag that there is no shoulder strap. I don’t mind because if I’m not holding it by the carry handle then I’m rolling it. 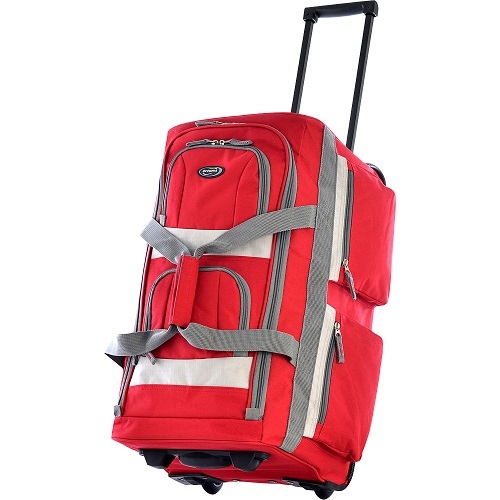 There are also no straps on the inside to hold your luggage down. This can be infuriating because the bag does not actually stand upright! It constantly falls over. I repeat it is always falling over! 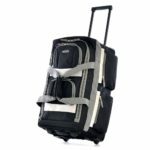 If that’s an issue for you then you should definitely look at this High Sierra rolling duffel bag. The last important part of any piece of travel gear is being able to travel with it. In this case we’re talking about taking it on flights. 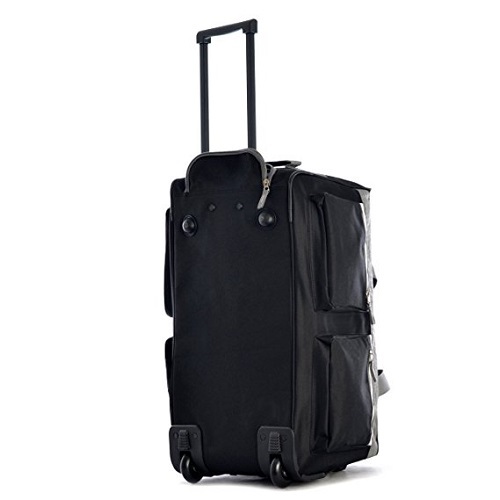 While the dimensions are listed at 22 inches high and 12 inches wide, this will fit most airline carriers but if you pack it up fully you may have a hard time getting this as a carry on. If you leave a little room, the Olympia duffel bag is able to collapse to the size of its contents and you should have no problem then with carrying it on. The Olympia 22 inch duffel bag has a couple of things going for it but has a lot of work to do to improve on its overall functionality. There were just too many things to ignore and honestly I would return the duffel bag if it constantly falls over. I like the ability to organize what I’m bringing but that doesn’t outweigh all of the other concerns. This Olympia duffel bag gets 3 out of 5 stars for functionality. The Olympia duffel bag has some things going for it and could use work in other areas. For the price this piece of travel gear is very inexpensive and that is its saving grace in my mind. The price is just phenomenal and too enticing to pass up. But let’s recap what was good and not so good. I like the fact that Olympia offers their travel duffel bag in a variety of colors to choose from. It allows people to express themselves more. The material is a sturdy 1200 denier polyester that while I used it for three weeks, never saw one issue with stitching, zippers, threads coming undone, none of that. The Olympia duffel bag does a great job of organization as they have a total of 8 pockets on this bag which includes the main compartment. The main area has a U-shape opening allow you to access anything in the duffel at any time without having to go through your other items. The duffel bag is collapsible enough that if you need to take it on an airplane as a carry-on you can do so. If you over pack it though it might be a tough fit. The price is too good not to mention. It is an extremely inexpensive duffel bag that I feel will hold up well in regards to durability. Olympia’s 22 inch duffel bag stinks, literally it smells. It has a plastic chemical kind of smell when you first receive it. You could clean the smell out with some baking soda and let it sit in the sun for a couple of days but if you have no interest in doing that, then look elsewhere. The wheels on the duffel bag are a little close and if you go over a bump or curb it will start to flip the bag over, very annoying. The handle does not really lock into place and will fall back into the duffel bag time and time again. 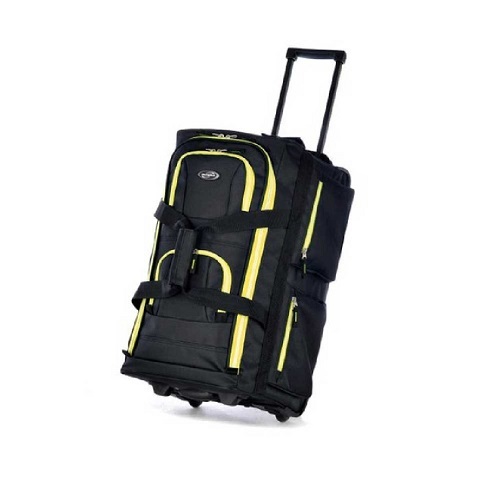 If you are looking for a duffel bag that doesn’t fall over constantly then find something else because the Olympia duffel bag excels at falling over. It will just not stand upright. There is no shoulder strap nor straps inside the duffel bag to hold your belonging in place, which can lead to wrinkly clothes. Olympia has a decent product on their hands here, by no means is it perfect or even the best option but for the price it is hard to pass up. Olympia does a lot of things right and a lot of things could use improvements. After considering all of these factors the Olympia 22 inch duffel bag gets 4 out of 5 stars! Have an Olympia duffel bag and want to leave a review? You can do so below!